What’s the significance of Reusable Launch Vehicle (RLV)? RLV is the unanimous solution to achieve low cost, reliable and on—demand space access. The making of the Indian space shuttle or RLV-TD has taken five years and the government has invested Rs. 95 crore in the project. This flight will test the capability of the vehicle to survive a re-entry at speeds higher than that of sound. The solution to reducing cost of launching satellites into orbit is to recycle the rocket or make it reusable. Scientists at ISRO believe that they could reduce the cost by as much as 10 times if reusable technology succeeds, bringing it down to $2,000 per kg from the present $20,000 per kg. What about NASA’s space shuttle programme? Nasa grounded its space shuttle programme in 2011 after using its reusable vehicles like Discovery, Endeavor, Columbia and Challenger for over three decades to launch various missions, including the International Space Station (ISS) and the Hubble telescope. Launch of India’s first indigenous space shuttle RLV-TD is the result of the industrious efforts of our scientists. Congrats to them. Scientists at ISRO tested the RLV Technology Demonstrator (TD), in the first experiment of its kind known as Known as hypersonic flight experiment. It was about 10 minutes mission from liftoff to splashdown. The purpose of the experiment is to help the shuttle glide over a virtual runway in the Bay of Bengal, situated 500 km from the coast. 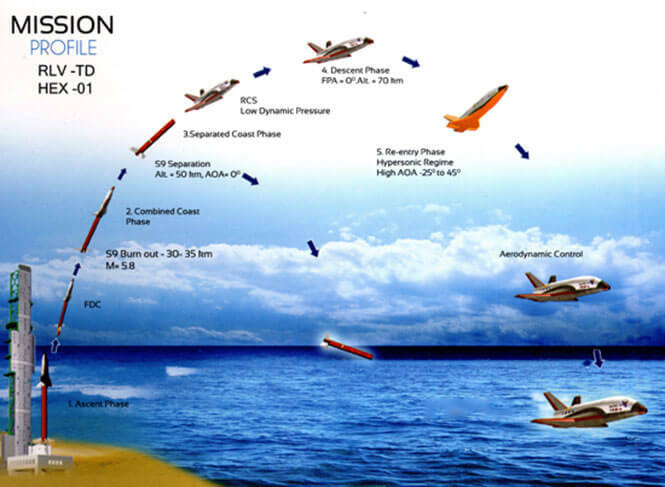 The RLV-TD is unlikely to be recovered from sea (Bay of Bengal) during this experiment as it is expected that the vehicle will disintegrate on impact with water since it is not designed to float. The 6.5 meter long Re-usable Launch Vehicle – Technology Demonstrator (RLV-TD) weighed about 1.7 tons. The special booster or the first stage is powered using a solid fuel that hoist the RLV-TD prototype to about 70 km into the atmosphere from where the descent began. During the descent phase, small thrusters helped the vehicle navigate itself to the landing area.